Why Is the ScrumMaster's Role Important | Leanify Ltd.
You are here: Leanify Ltd. > Blog > Agile > Why Is the ScrumMaster’s Role so Important? No matter how good a process or methodology is, results are not impressive unless people understand and apply it properly. This is even more true for Agile and it makes the role of the ScrumMaster very important and sometimes quite challenging too. It is definitely not about organizing meetings (oh, yes, I’ve heard that too!) but much more about mentoring and coaching the team to keep the process within the framework of good practices, inspecting and adapting them continuously. In my experience, I have been communicating with many ScrumMasters and teams where Scrum is applied. Some of them share that results are not what they have expected, and that they even don’t see the benefits. After a more in-depth discussion however, it turns out that what they have done is far from real Scrum principles and ideas. In these conversations I realized how important it is that the ScrumMaster is well familiar with the process, so that he/she has the power to withstand it and serve as an example, to help the team achieve sprint goals. In order to apply Scrum correctly, a shift in mindset and behavior is required. The team needs to learn how to take responsibility, and management – how to not interfere with team’s work. Below are some of the common mistakes when applying Scrum, and relevant ideas that a ScrumMaster could use to point things in the right direction. In most teams these mistakes usually occur in the beginning, and unless the ScrumMaster weeds them out, the team will continue doing them; the process will deteriorate, and will not bring the expected benefits. In the beginning when an organization starts applying Scrum, managers typically have not changed their way of thinking yet and continue with the previous approach of assigning tasks to people. 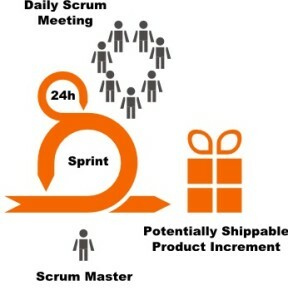 This however is very wrong in Scrum, as the team needs to distribute the tasks on their own; the tasks are defined during the sprint planning based on the product backlog supplied by the ProductOwner. The ScrumMaster needs to be alert for these attempts for interference and protect the team from external influence (in this case, by management). He/she could talk to the team and explain that in Scrum the team alone is responsible for planning and execution of sprint tasks and they shall not accept management interference. On the other hand-side, the ScrumMaster must talk to the manager, explain him/her Scrum rules, and insist that he/she does not obstruct team’s work. In addition, the ScrumMaster could point the manager to the ProductOwner for a discussion, if the task is related to a possible change in the product backlog. Also in the beginning, people in the team are typically not used to taking the responsibility for task execution and the decision to take a task and define how he/she will implement it. In this case, some people are used to having somebody else assign them tasks and decide for them what and how needs to be done. The ScrumMaster in this situation has to explain the team that it’s their responsibility to decide which task will be implemented, by whom, and how. If the talk does not yield results, the ScrumMaster has to prevent attempts for external interference of managers who would love to “help” by assigning the tasks and explaining how to do them. If the team is left alone long enough, they will learn how to self-organize and take responsibility. Another mistake that is commonly seen, is being late for daily Scrum meetings. In most cases, it’s just a few people that come late, but this is bad because they waste the time of those people who are punctual. In this case the best approach is ScrumMaster’s own primer. If he/she is never late and demonstrates to the team that starting the meeting on time and with all participants is important, results will be positive, and people will do their best to come on time. This is only a small list of mistakes that are typical and that the ScrumMaster needs to spot and fix. By all means, ScrumMaster’s own primer is very important. He/she needs to know the Scrum principles well, firmly withhold them, and follow for their correct application. Only then will the results be impressive – the team will be motivated and will enjoy their work. Customers will also be content with what they get, and the company will increase its profits accordingly. ← What Do Coaching and Agile Have in Common?